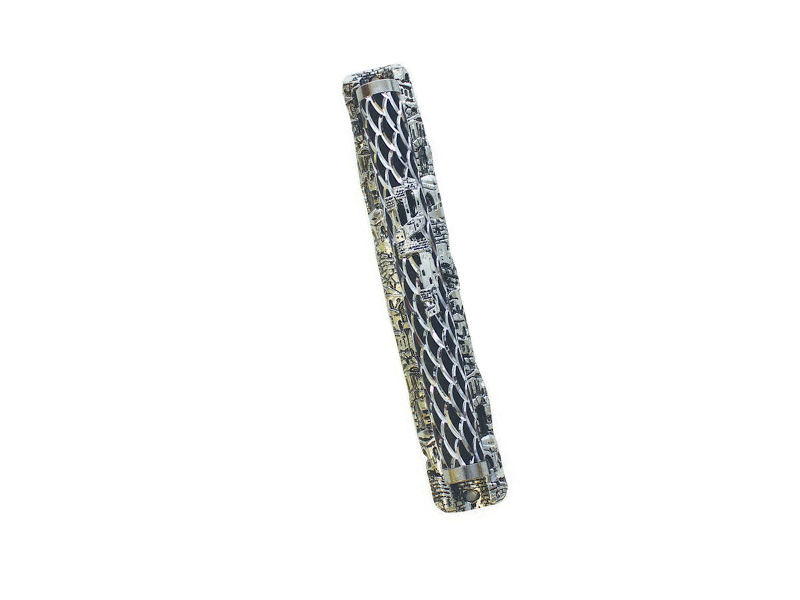 This magnificent aluminum mezuzah case is designed with intricate detail. Scalloped silver colored lines with a black background make up the circular case in which the mezuzah parchment is placed. The case is decorated with the three Hebrew letters Shin, Dalet and Yud in the length, the Hebrew name of G-d that is associated with the guardian of the home. The case includes a decorative flat frame embossed with the Jerusalem background. The case has two holes on each end allowing the case to be easily affixed with nails to the doorpost. The case is available in different lengths to accommodate different mezuzah scroll sizes. Mezuzah parchment scroll is not included.